This week’s restoration is a fun one. It reminds me of when I was a young boy and I watched Channel 3 out of Syracuse, NY on a black and white TV set after school. The show I watched was Popeye, a popular comic strip, developed into a television cartoon, and even a movie starring Robin Williams. 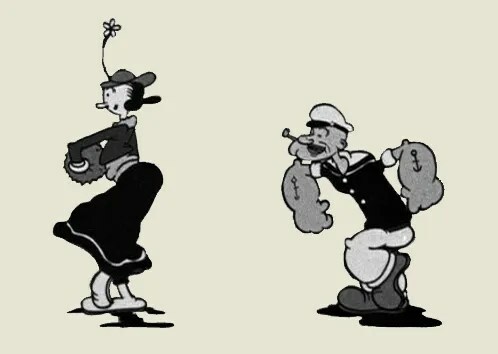 Here is a photo of Popeye, with his spinach enhanced forearms, and his best girl – Olive Oyl. Below is the Popeye themed pen, after I took it apart. You can see that it is a standard lever filler, with normal brassing and ink stains. I rightfully assumed that the gold furniture was plated, so I took care not to apply any abrasives to the lever, clip, nib, or decorative cap ring. I cleaned out the inside of the cap which was caked with old blue ink. I then dropped the cap and nib into an ultrasonic cleaner to gently clean off any dirt and ink from the gold plating. It did the trick and as you can see, most of the pen cleaned up well. The barrel and cap are plastic and I was able to thoroughly polish them and apply some carnuba wax to the finished product. I scraped the section end, removing all of the old sac and cleaned the channels of the feed with and x-acto knife. I then reinserted the newly cleaned nib and feed back into the section and affixed a size 16 sac with sac cement. I let it stand sit overnight and then reinserted the nib/feed/section assembly back into the barrel. You can see the finished pen below, measuring 4 13/16 inches closed and 5 13/16 inches posted. This pen reminds me of the Pepsi Pen that I restored and wrote about in my post of September 7, 2009. Both were advertisement pens, promoting albeit different products. In my post if the Pepsi Fountain Pen, I speculated that it was an Eagle Pen Company product. The EPENCO nib on this pen confirms that they in fact had their hand in the production of this pen. 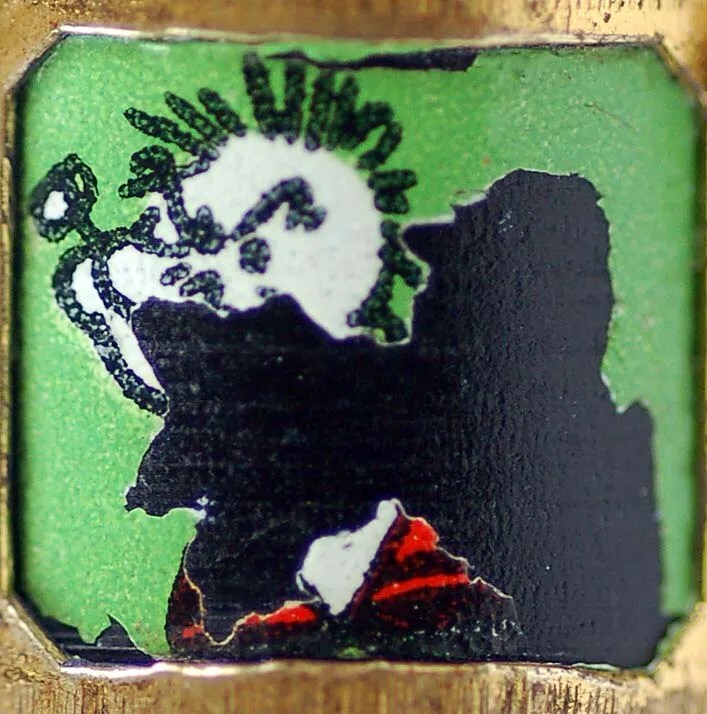 Eagle (New York City based) was known for producing colorful pens in the 1930s – some of you may have seen the Stars and Moons pens that they produced during the same time period. They are not high quality vintage pens at all and were definitely aimed at the lower end of the market – in this case the novelty market. 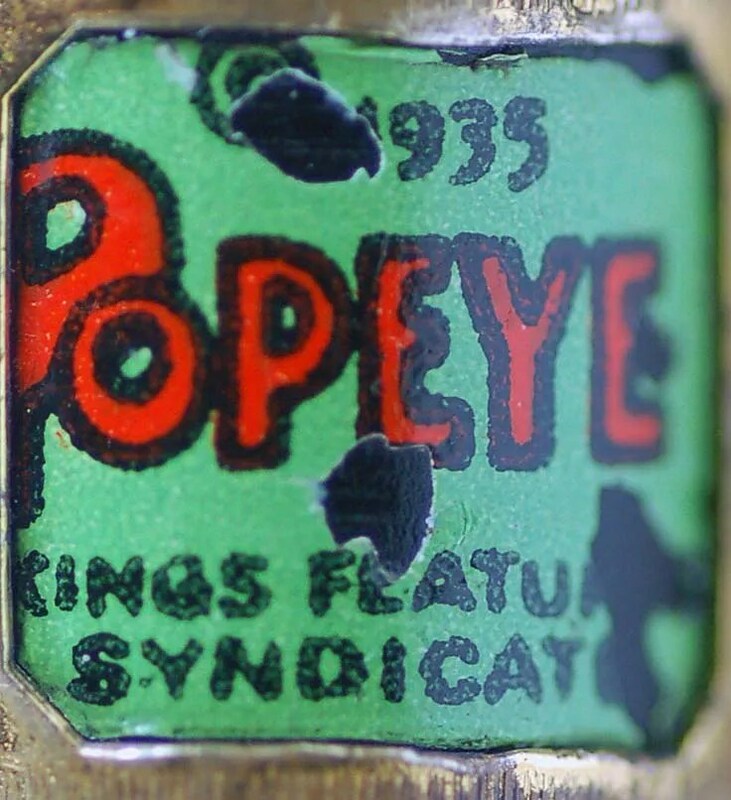 The cap ring has the following three inserts ~ the first being Popeye himself with his signature pipe, the second being a chipped version of him with his sailor cap off, and the third is the King Features Syndicate logo with the 1935 identifier. As a pen collector, it is always nice to have this date for reference. 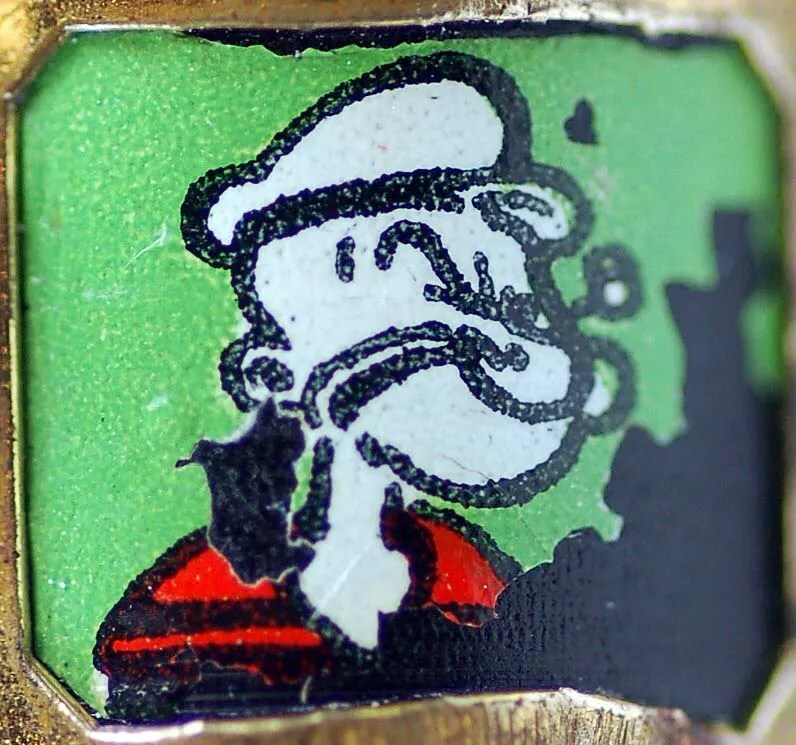 Popeye first appeared as a stand alone King Features Comic Strip in 1929, so this pen was produced during a high point of the comic’s popularity in the 1930s. In the course of investigating Popeye Pens, I found that there was another version of a Popeye Pen, probably produced by the Arnold Pen Company (Petersburg, VA), around the same time period. Just what I need, another pen to search for…..and I probably should start looking for some spinach colored ink while I am at it. 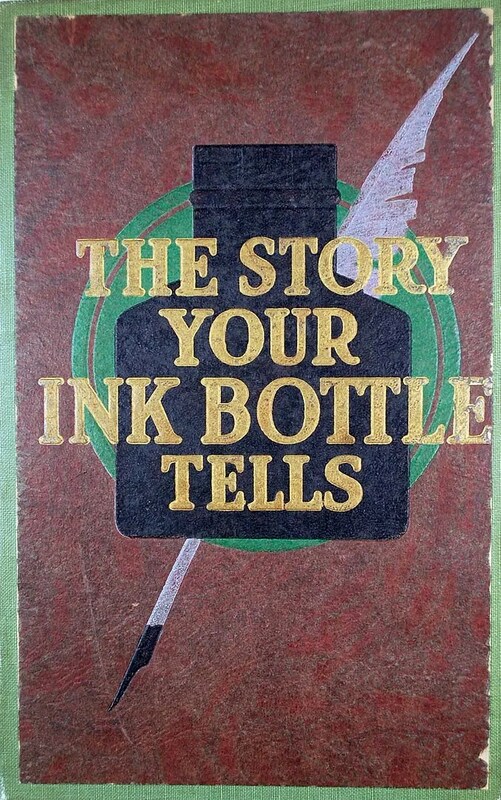 I recently picked up a book titled ” The Story Your Ink Bottle Tells”, as it was rejected from a library. The cover, shown below, doesn’t reveal that it is actually a book published by the Carter’s Ink Company. 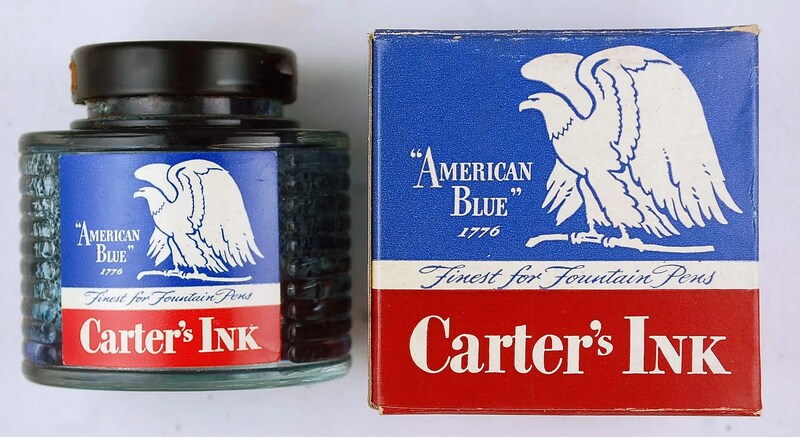 It covers all aspects of the Company, including the history of ink production, different types of ink, and the production process at Carter’s in Boston, MA. There are many interesting photos in the book of the Carter factory, machines, and production lines. I would place the publication date in the late 1920s as the Library Stamp on the inside cover is 1928. The withdrawal stamps on the back jacket show that it was checked out 12 times between May of 1933 and April of 1992. Here is Chapter 1, with a large photo of the factory, presumably in the 1920s. 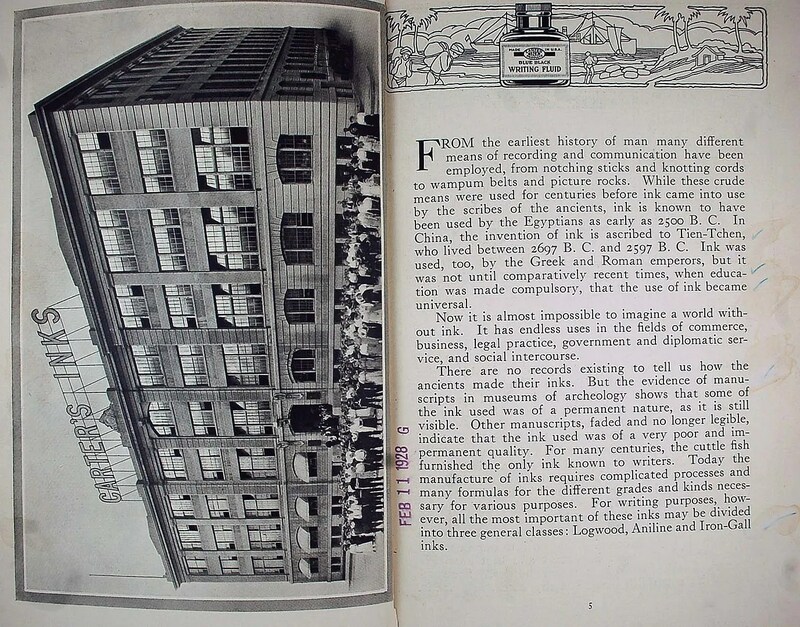 The last page shows a sketch of the factory again. 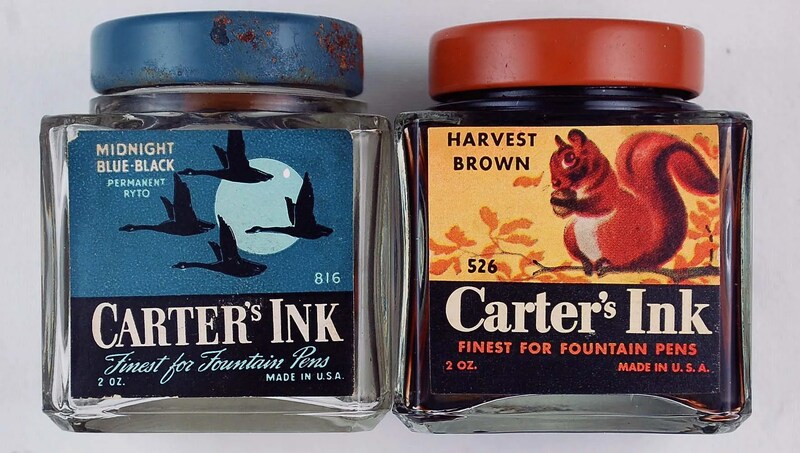 After purchasing this book, I thought it would be a good idea to put together some of the magazine advertisements and ink bottles in my collection relating to Carter’s. Here is a Saturday Evening Post Advertisement from an October 25, 1941 issue, promoting their very creative and colorful cubes, priced at 10 cents. These are very interesting, colorful and easily collectible bottles for the fountain pen enthusiast. I have photographed the seven cubes that I have in my collection below. This is by no means a comprehensive collection – just ones I have run into over the years of looking for pens. I have seen photos of several collections that are amazing and include most or all of the cubes that were produced – amazing collections. 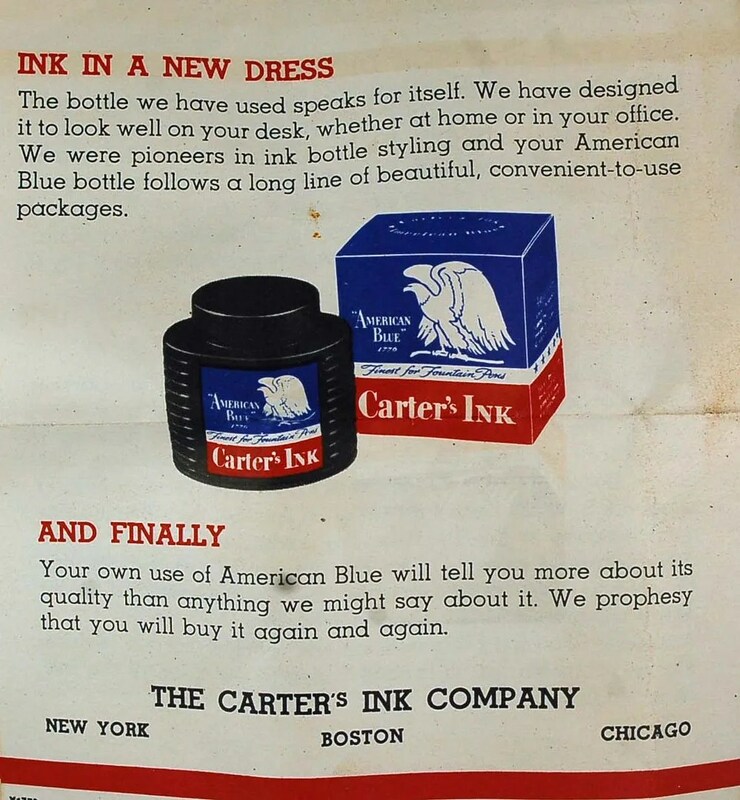 Here is another advertisement for the American Blue Ink produced by Carter’s at about the same time, followed by a photograph of a box and bottle of this ink. When I found this the box was in excellent condition, but unfortunately the ink bottle was empty. Below is the insert that is in the above box. Carter’s prophesies that the user will buy it again and again. 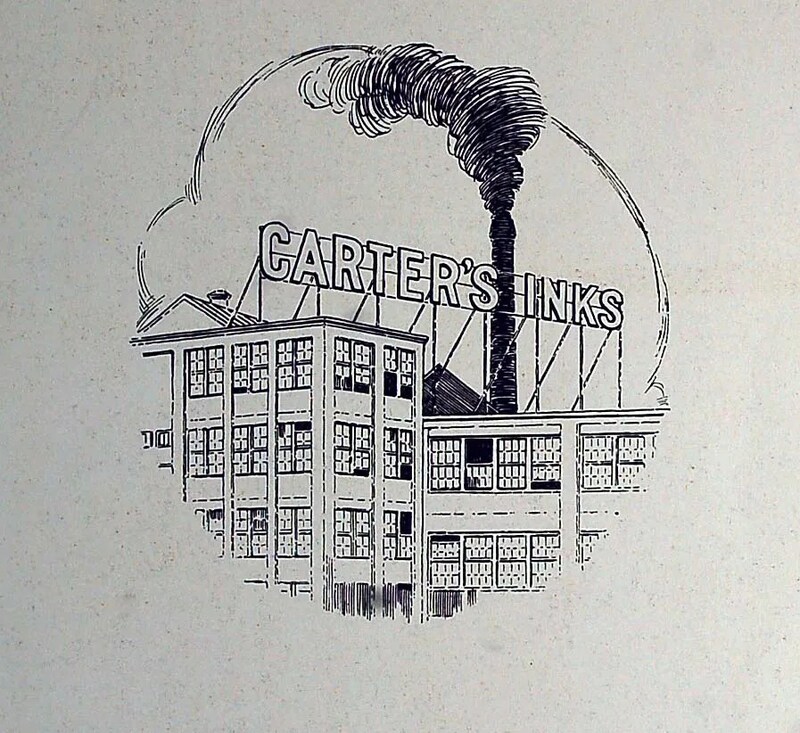 The final piece of Carter’s ephemera that I have is the blotter below, provided by J. F. Parker of Danville, VA. The Colonel Roosevelt referred to is Theodore Roosevelt who was the 26th President of the United States, prior to this trip in 1909-1910. 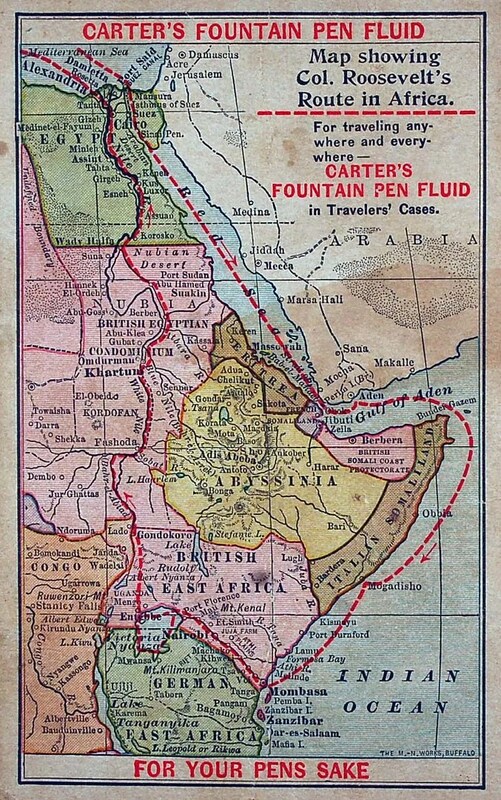 The trip, which included Carter’s Pen Fluid, is detailed here ~ Theodore Roosevelt’s African Safari & Scientific Expedition. This blotter clearly predates the ink cube advertisement above by many years, maybe close to 30. 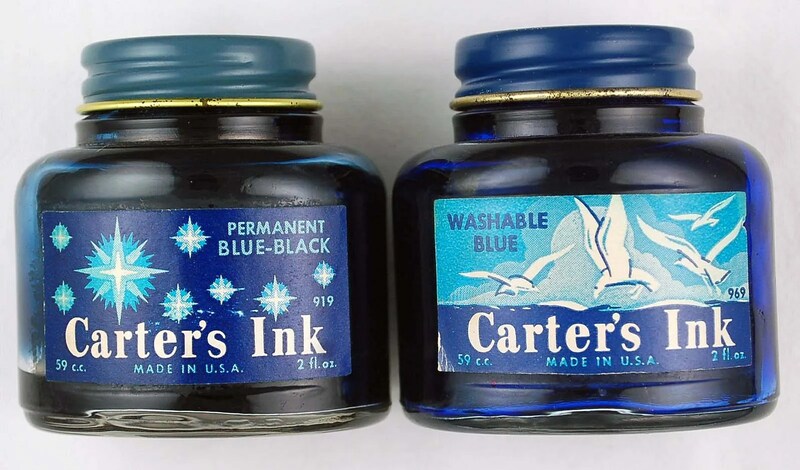 I had not written about inks in quite some time – the last being Ink Spots, on January 23, 2008. 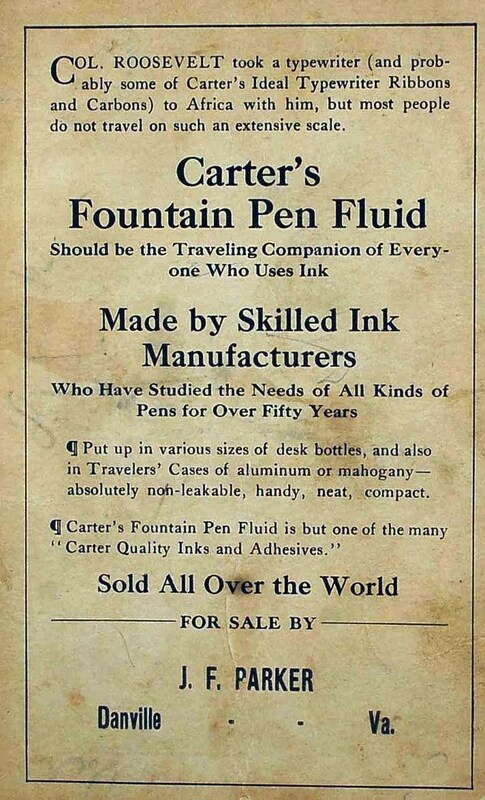 That seems like a long time, considering how important ink is to the fountain pen. Over the next year, I will try to research a few more. If you read my post of last week (Moore Tuscan And A Yankee), you will remember that I recently received two fountain pens from a collector friend in Michigan, with the request to restore two family heirlooms. The first restoration was a Moore Tuscan, and that was an honor to work on, and a beautiful pen resulted. The next pen, and the subject of this post, is an old favorite, a Yankee Pen, from Grand Haven Michigan. I restored and written about several of these over the past four years. Here are a few, for reference. Also, any posts (search at right) covering Pencraft, Belmont, or Dixie would be related to this pen. You can see from the photo below that this lever filler had a hanging pressure bar, common to many Kraker models of the day. 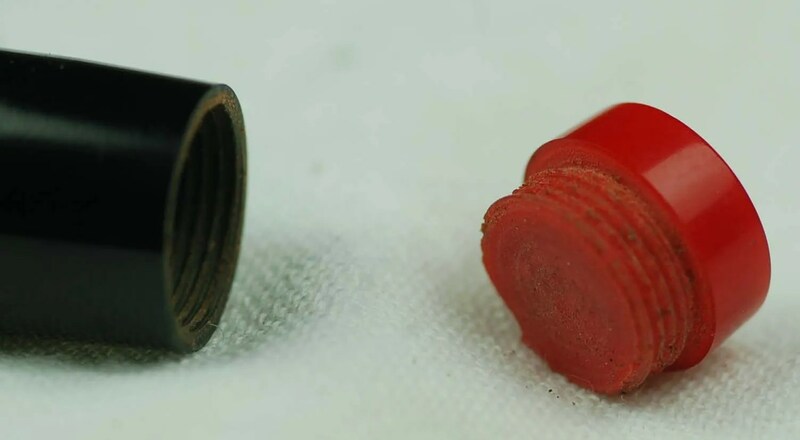 The sac had hardened and the bar was loose and not attached to the end piece. 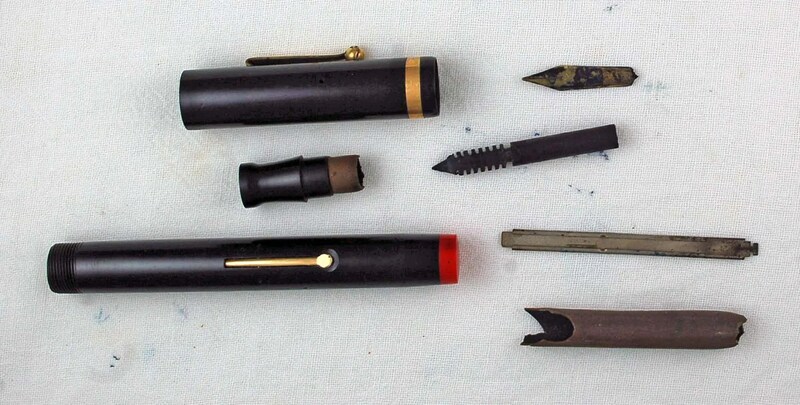 I cleaned the gold trim ~ clip, lever and nib ~ being careful not to get any polish on the black hard rubber. I scraped the section, removing all remnants of the old sac and reinserted the nib/feed to the cleaned section. I attached a size 18 sac to the section/feed/nib assembly and fit it back into the barrel, where a new large j-bar had been inserted. The whole mechanism works fine as I tested it with water and let it sit overnight. Here are two photos of the completed pen, capped and uncapped. It is a large pen, 5 1/2 inches capped and 6 3/4 inches posted. Here is the imprint, very crisp and clean. As discussed many times in the past, the Michael George Company was named for its owner, George Michael Kraker, the movable pen maker, with stops in Kansas City, Minneapolis, Chicago, Grand Haven (MI) and Libertyville (IL). I would speculate that this pen was produced in Grand Haven in the mid to late 20s, around the time of the Tuscan pen that belongs to this owner. Many of the Kraker Pens I have repaired have colored (red or yellow) ends on the caps and/or barrels. I have not seen one with screw out ends, however. Here is a close up of the barrel end. Unfortunately, the cap end is missing. If anyone has access to an one, let me know as I would like to get it in the hands of the owner. 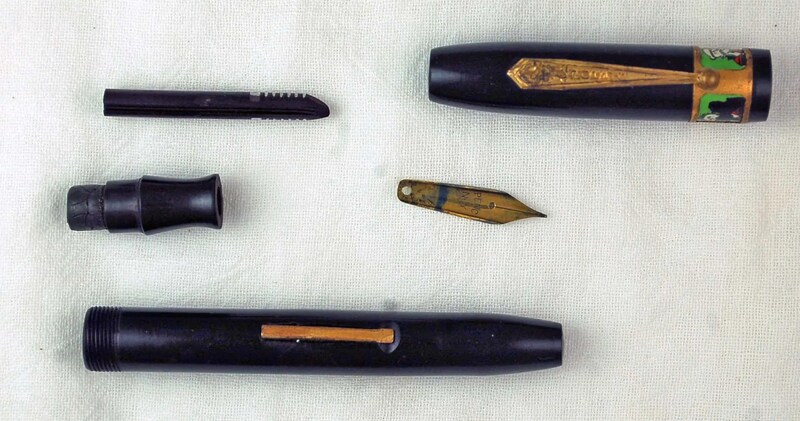 Now for the Surprise ….. the nib is a Yankee 2. I have seen Warranted, Forever, Pencraft and Dixie nibs on Kraker Pens of this era, but never a Yankee nib. I checked with another Kraker collector and he confirmed that he had not seen one either. Clearly they exist, as evidenced by this nib. I would love to hear from anyone who has photos of other Yankee nibs and their supporting pens. So, like the Moore Tuscan restored in the previous post, this pen is now back in Michigan where it was originally assembled. I was lucky to have had the chance to handle both of them and get a few photographs before they left my workbench.